The message of St. Catherine: be resolute !! There is a ‘Monastery of St. Catherine’ which is named after the patron saint of our church, whose feast day is 25th November. The monastery was built by the Roman Emperor Justinian (around 482 to 565 AD) at the foot of Mount Sinai to protect the monks living in that region. The monastery’s name is derived from a legend which tells that the corpse of St. Catherine, martyred for confessing her faith in Jesus Christ, was carried by angels from Alexandria to Mount Sinai. Everything else we know about Saint Catherine comes from legends, too. But legends are not merely fiction: they are always based on a verifiable historical event. The legends surrounding St. Catherine have their roots in the Great, or Diocletian, persecution of Christians (303-313), regarded as the last and most severe persecution of Christians in the Roman Empire. St. Catherine stands for countless unknown victims of this and other persecutions. The stories about her bring together many historical details. These include the imperial cult, whose purpose ultimately was to unite the empire’s many and diverse peoples – and on the other hand, the fact that the Christians could not accept the cult, frustrating the Emperor’s unification aims. The legends also reflect the influence of individual Christians’ courage in the face of death – making their faith attractive to thoughtful contemporaries. At the same time, there must have been Christians whose resolve weakened when they found themselves in mortal danger, and who denied their faith – a problem that many Christian communities had to grapple with. The legends make St. Catherine an example of someone who was initially a seeker, an inquirer, who after her baptism became a resolute young woman who followed her chosen path fearlessly and was ready to talk about her faith, trusting in divine assistance (see Mark 13, 3-13). Mount Sinai points us in the same direction: it stands for divine revelation and the Ten Commandments, God’s rules for life. It was Catherine Masson, the founding benefactor, who chose our patron after her Christian name. That means the task for our communities (both Anglican and Old Catholic who now worship here) is to allow ourselves to be challenged by this patron saint. We don’t face persecution today, thankfully. But what is expected of us – and this is certainly an area in which we still need to learn and grow – is that we are resolute in our faith in the God revealed through the life of Jesus Christ, and resolute in our decision to follow him. But decisions always have two sides: affirming what we recognise as true, and at the same time rejecting everything that contradicts and conflicts with that truth. I would like to gather together a confirmation group – not urgent but if you have not been confirmed have a think and pray about this, talk with family/ friends, talk with me….. I am posting some details about what Confirmation is, on the website. We are putting together a “scratch” choir for leading the carols at this year’s carol service. If you enjoy singing (maybe you were in the school or church choir in the past?) come and join in. Feel free to bring a friend too. We will have three practices to run through the carols and make any decisions about whether we can manage to sing in parts or just concentrate on adding a unison lead for the congregation. Please bring a copy of the Bible in your mother-tongue with you. The Children will have a special role in this service, if you haven’t already let Kara or Marianne know your children would like to take part please do so. This group includes women from other countries who have their own communities and hold church services in their own mother tongue. There are women from Korea, Greece, Finland, Egypt as well as those from our church. As every year we are celebrating Advent with an “Adventsfeier” on Friday, 14th December 2018 in the CVJM Haus, Büchsenstrasse 37, first floor, room 100 from 4pm until 6 pm. We talk about religious customs surrounding Advent and Christmas in other countries and sing carols as well as being entertained by the Greek choir, whose members come from different countries too. More details will be provided in due course. Let me know whether you will be able to come. 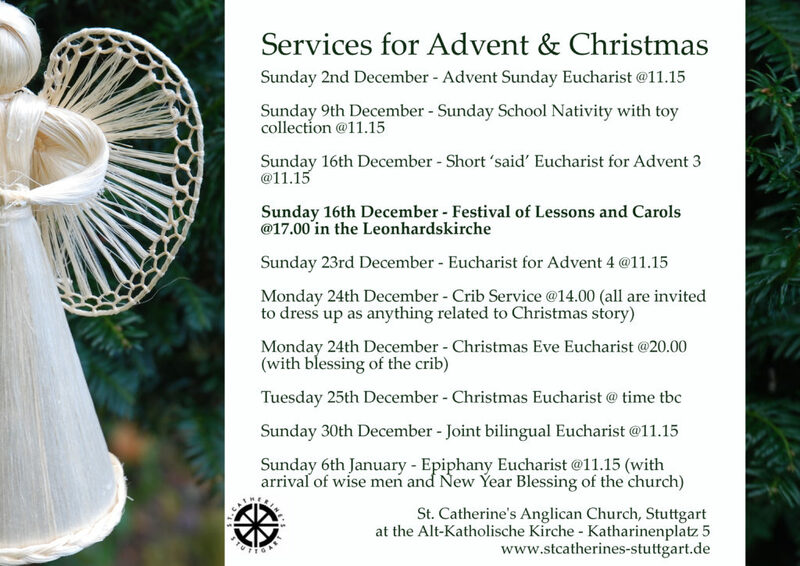 As everybody is always so busy during Advent we have decided not to have a December meeting. We will get together again on Thursday, 17th January 2019 from 10 until 12 in the Anglican Centre so please put the date in your new diaries!